The Military Ministry continues the tradition of recognizing and honoring those in our parish who are or have served in our military on national military holidays of Memorial and Veterans Day. 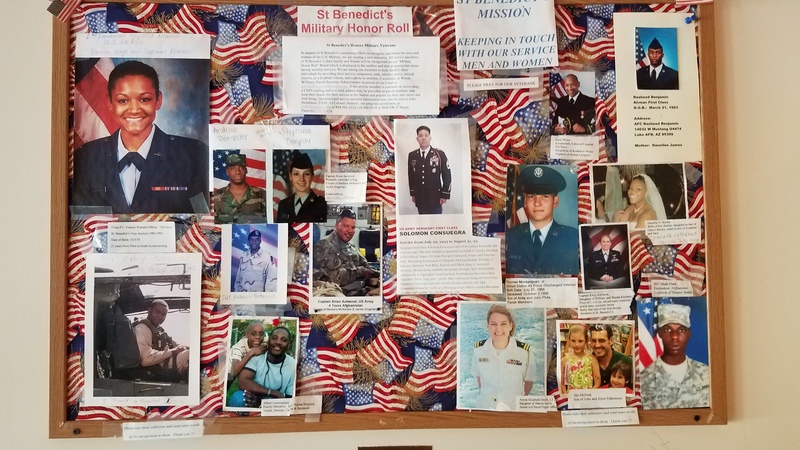 Our goal is to recognize all military service members of St Benedicts and their families on our Military Honor Roll Board in the narthex and also at appropriate times during worship services. Our committee, on behalf of our parish, will send their thanks and birthday wishes to honor them for their service to the Nation and prayers for their safe travel. This includes active, retired, reserve, or veterans. Contact Coordinator John Steinbauer, USAF, Lt Colonel (Retired), at jfs9840@gmail.com or 210.386.9018 (Cell) for additional information. Contact John or Shelby Decker at shelbymdecker@gmail.com or 954-494-5810) if you are interested in supporting the Military Ministry in 2019.